David Cameron has announced that MPs will vote this Wednesday 2 December on bombing Syria. Stop the War is asking all its groups and supporters to protest tomorrow night, Tuesday 1 December, against plans for bombing . In London we will be assembling at 6pm in Parliament Square where we will hold a rally and then march to Labour and Tory Party headquarters, both nearby. Elsewhere there will be protests in town and city centres around the country. Our campaigning has already made a big impact and been widely reported. Over 40,000 people have already lobbied their MPs via the Stop the War website alone. The Mirror, the Mail, The Financial Times and Observer have all come out against bombing, recognising how incoherent and dangerous David Cameron’s plans are. We are urging people to use the little remaining time and every means available to maximise the pressure on MPs. Please encourage everyone you can to lobby their MP by phone or email and publicise the protests as widely as possible. We must do everything we can to stop MPs voting the UK into its fourth war on a Muslim country in 14 years. This page will be updated as we get more information. 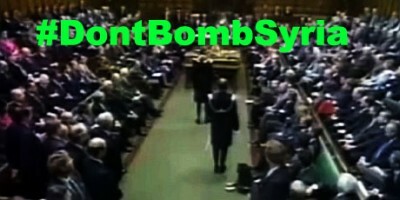 Follow theDon’t Bomb Syria Action Page for updates of protests round the country.